High-level IDE to build, test and deploy high-performance low-latency algorithms, distributable on different collocated sites, the algorithms can analyze incoming market data and implement proprietary trading strategies in less than 50 µs. implementing “sponsored access” offering low-latency direct access to markets, with/without any pre-trade risk management, with/without any algo development support. 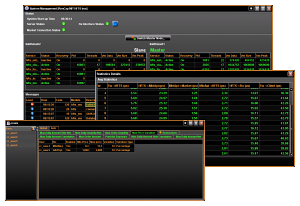 The HFT Risk Gateway is the Gatelab software low-latency high-throughput solution for normalizing markets access, controlling end-user operational risks and forwarding orders to the specified market. There are more than 15 risk checks for Equity, Forex, Futures and Options including real time initial margin calculations. Complex Event Processing (CEP) environment which is the core of the architecture, focusing also on its distribution and cooperation over a network (LAN, WAN) in order to provide a unique, distributed, consistent layer to the running strategies. In this scenario the CEP architecture is based on a high-performance distributed blackboard (across several servers) used not only as a distributed repository for low-latency market data and historical data, but also to share internal data produced by each strategy implementing local or remote cooperation between them. The CEP engine can process high volumes of fast-moving market data [notified through the traderpath (more info...) DMA platform] from several sources and perform actions in the market in tens of microseconds to decide, monitor and analyze execution activities. This allows traders to write collocated cooperating distributed strategies: i.e. one reading market 1 data events, signalling checked markets behaviour to remote collocated strategies to trade on their monitored markets and vice versa. compile the tested strategies into machine language to decrease the latency of strategies’ computational timeframe: from the 300-500 µs of the canonical environment to the 30-50 µs of the HFT environment. 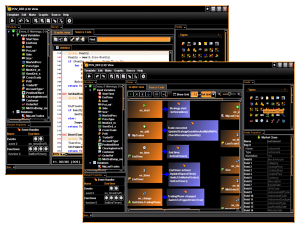 The IDE is made up by three modules: Point & Click Event Editor, Guided Action Editor and Run-Time Environment. The Point & Click Event Editor easily allows to graphically depict AND-ed or OR-ed Events-Actions behavior of the strategy with input, state and relation parameters. The Action Editor allows writing actions in a language sensitive environment using enhanced Python. Using this IDE, end-users can focus on business logic (described in terms of events and related actions) rather than on other relevant programming aspects.